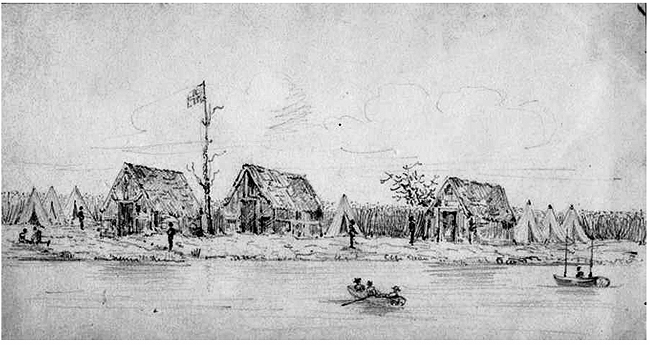 The sketch is identified as "Rear Admiral (British Royal Navy) Malcolms tents on Dauphin Island." Feby. 8th. 1815, and remained there till the 5th April, when they received information of the peace. Sir Alexr Cochrane sailing on the 18th Febry. Left Adml Malcolm in command." Battle of New Orleans, near the end of the War of 1812.
with The English Crown. He also saw action in the 1804-1805, Battle of Trafalgar. in command under Sir Alexander Cochrane and Rear-admiral (afterwards Sir) George Cockburn. to enforce a rigid blockade of the island and to keep a close guard on Napoleon Bonaparte. was again commander-in-chief in the Mediterranean. "Malcolm, Pulteney". Dictionary of National Biography. London: Smith, Elder & Co. 1885-1900.